Watch our flyover video. Quicktime required—6 MB download takes about a minute on broadband. You can also view our award-winning interactive 360 degree tour here. The tour was developed by School of Rock alumna Lisa Tossey. The JR’s physical dimensions are truly remarkable. No really—this a BIG ship—ready to do an amazing job of collecting samples to help us understand the Earth by unlocking the doors to our future through increased knowledge of our past. See past expeditions for yourself, and learn why cores can teach us so much. 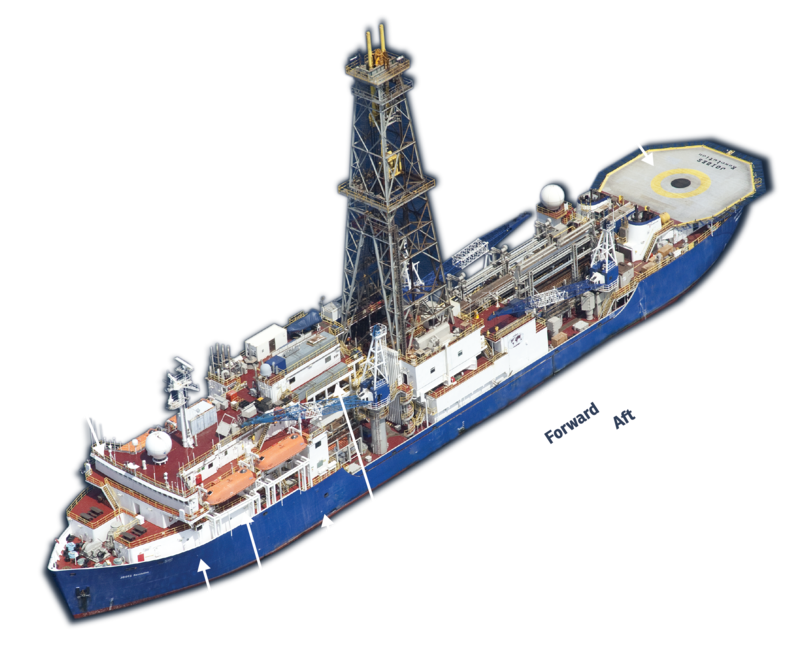 Fitted with a derrick standing 62 m (205 ft) above the water line, the 143 m (469 ft) long research vessel is 21 m (69 ft) wide. When the JOIDES Resolution reaches the drilling site, the crew positions the vessel over the site using 12 computer-controlled thrusters as well as a main propulsion system. The rig suspends up to 9,150 m (30,020 ft) of drill pipe to an ocean depth as great as 8,235 m (27,018 ft). This is about the equivalent of six miles! Near the center of the research vessel is the “moon pool,” a 7m (23 ft) wide hole, through which the drillstring is lowered into the ocean. Each piece of pipe is about 28m (93 ft) and weighs about 874 kg (1925 lb—just a tad more than a draft horse). The drill crew uses the draw works to thread each pipe to the drill string. The process of lowering the drill bit, which is affixed to the end of the drillstring, takes about 12 hours in 5,500 m (18,045 ft) of water. To core through the seafloor, the crew uses a motorized system to rotate the entire drill string. The thrusters on the ship keep the massive vessel itself from rotating. This scientific drilling process recurs on several sites during each JOIDES Resolution expedition. Six miles of pipe are positioned in the ocean, and dropped from the deck of the ship. The drillstring and drill bit are rotated, with thrusters keeping the vessel in place so only the drill moves. This ocean drilling operation is a significant engineering feat in itself. But the drilling sample story and research done in the vessel’s labs are even more amazing. At the bottom of the research vessel is the general cold storage. The tween deck holds the JOIDES Resolution’s recreation areas (a gym! ), computer and data services. Houses the dining room, kitchen (galley) and laundry room. Contains chemistry, microbiology, paleontology, and X-ray laboratories, as well as a conference room for meetings and presentations. Where scientists and technicians handle cores, sampling, and description. Also on this deck are the physical properties and paleomagnetism laboratories, downhole measurements, and the core photo table. Holds science offices, operations offices and a nitrogen generator. At the fantail of the JOIDES Resolution, the underway geophysics lab contains the equipment that gathers ship position, water depth, and magnetic information useful in studying the topography of the seafloor. Living quarters, the hospital, and library are located in the forward section of the research vessel. Starboard – The right side of the boat. Towards the right-hand side of the ship facing forward. The drillship was built in 1978 in Halifax, Nova Scotia, as a conventional oil drilling vessel. Then named Sedco/BP 471, she was refitted in Pascagoula, Mississippi during the fall of 1984 to accommodate the laboratory stack levels and other scientific facilities and equipment necessary for carrying out the program’s objectives. When drilling operations began in January 1985, the ship was informally christened JOIDES Resolution after Captain James Cook’s flagship of two centuries ago, HMS Resolution. She now officially carries the name JOIDES Resolution. Measuring 144 meters (470 feet) long and 21 m (70 feet) wide, her derrick rises 66 m (215 feet) above the waterline and can support 1 million pounds of weight. The ship maintains location, even in heavy seas, by means of 12 computer-controlled thrusters, which are part of her dynamic-positioning system. She can drill in water depths to 8800 m (29,000 ft). In contrast to standard petroleum practice, drilling is done in riserless mode; therefore, extreme caution is exercised at all times in avoiding significant hydrocarbon accumulations.